Suzanne has served as CEO for Hough & Guidice Lamonica Associates and as Vice President of Century 21 LaMonica Realty from 1998 to 2011. Suzanne is also a certified recruiter/trainer for the Century 21 System. 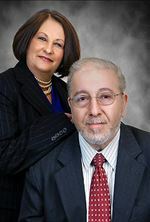 "It is with great pride and enthusiasm that I have now joined the Realty Connect USA Team of Real Estate Professionals. An innovative, technology oriented company that will propel us to the next generation of Real Estate." Suzanne's dedication, determination and integrity to her clients is what makes her.